Isn't this a unique sketch? 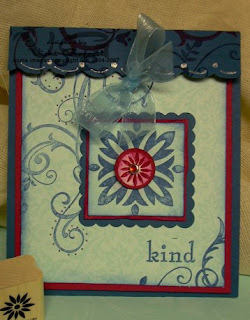 I designed this card for a sketch challenge swap that was posted on one of the groups that I was on. I free handed the arrow (THAT was an interesting process!) and made good use of my punches. I used Celery and Soft Sky Designer Paper, which is available in the New Catalogue, along with many other delicious Colours that are perfect for combining. The Stamps are from the Office Accoutrement and Everyday Flexible Phrase Collection from Stampin' Up as are the brads. 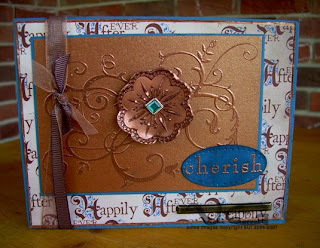 Lots of layers give this card a fun look! If I don't get back tomorrow, Happy Canada Day to all my friends celebrating! A Simple Project made with the new Baroque Motifs Stamp Set!!!! Only two more Sleeps and we can buy from the New Catalogue!!!!!! I am SO excited. There are so many Great things to get!!!! 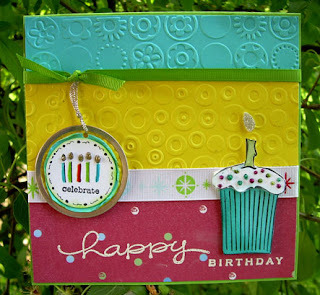 If you link to my Stampin' Up! Website, you will be able to view the new goodies at noon on July 1st! This project was quick and easy and made with two coaster. For the back Coaster, you cut a triangle shape (cut only one long side and one short side, scoring the other long side to make the Photo Stand-not clear as mud???? Go check out the back of one of your table top picture frames to get the shape!). 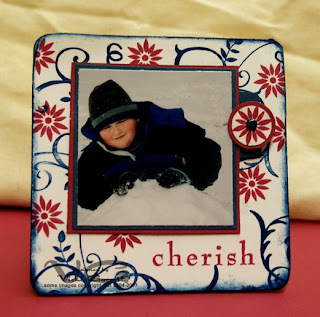 The top coaster was covered with Whisper White, sanded, stamped and embellished. Adhere the decorated portion of the coaster onto the frame base, and Voila!!! a cute little table top framed picture!!!! I used, Pomegranate, and Not Quite Navy for this Project. The best way to describe my good friend Darlene is kind. We met under very interesting circumstances when I was signing up to be a Stampin' Up! Demonstrator. We both went to a weekend crop where we ended up cropping and chatting until dawn!!! Five years later, I feel so blessed to have her in my life. 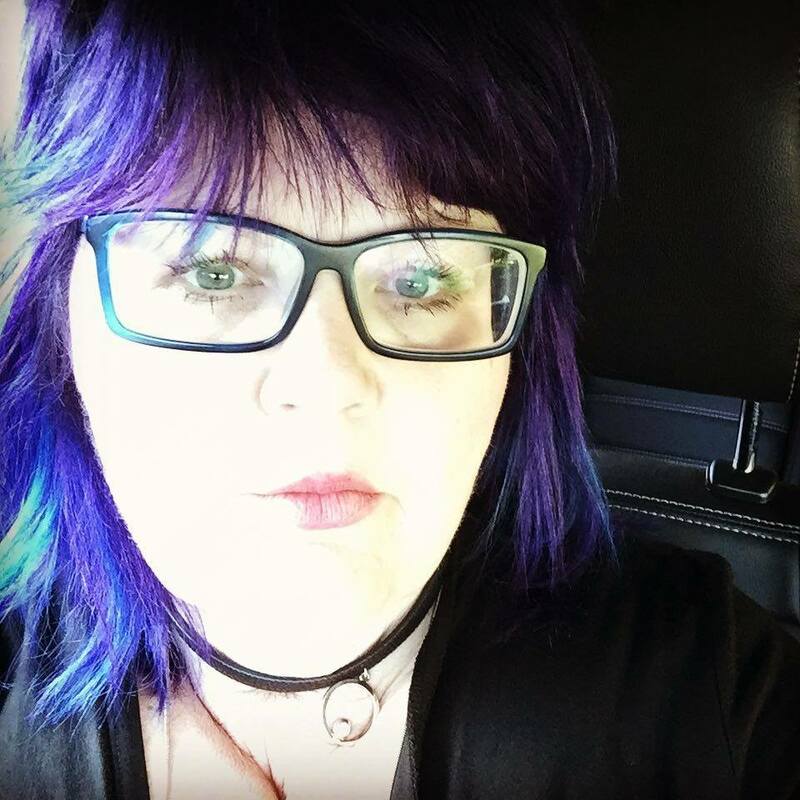 She is thoughtful, funny and shares my papercrafting addiction. In fact we are off on a little road trip today to check out some Scrapbook Stores. Wishing you many more Happy Birthday's Dar! You deserve the best! This card is made with the Baroque Motif's set as well. I can't wait to make more cards with it. Isn't that Flourish Pretty. I used Summer Sky DP as a design for my base. In addtion, Not Quite Navy and Pomegranate are a nice combination. The little Brad in th emiddle of the Flower is from the Fire Circle Brads Collection. I used the Corner Punch to Scallop the edges and a Scalloped Square for the base of the Main image. I cut my Cardstock at 11x4.25, score one edge in at 1.5 and then added eyelets to tie the whole thing up!!!!! Well, better go, it's time to hit the road! Did you know that in less than four days the 2006/2007 SU! idea book and catalogue will retire? I am sad to see many of the great stamp sets and accessories leave, but can't contain my excitement about all the awesome new stuff that I will be able to play with!!!!!! Can ya feel my EXCITEMENT?????? This card is made with the new Baroque Motifs set found in the New Idea Book and Catalogue. Isn't it positively yummy??? Have you ever tried to make your own medallions??? It is EASY AS PIE.........well actually easier ( I am not much of a pie maker!). All you do is stamp a piece of card stock, slight larger that the medallion you are making with a liberal amount of versamark. Holding the embossing gun UNDER the paper (saves from flying EP getting all over the place) heat the powder until melted. Repeat this process twice again and you will have a nice fat puddle of oozie EP on your paper. Now take your stamp, which you have inked up with versamark as well and press it carefully into the EP puddle (I say carefully, because you don't want it to slide and ruin the image). Let it sit in the puddle for a minute or two until the EP cools. Then pop the stamp off and punch or trim around the medallion as you see fit. For a little Variety you can use some Black Stayzon on your image to create deeper lines!!!!! The rest of the accessories used to design the card include DCWV patterned paper, Karen Foster Bar Brads, SU! Oval Punch, Organdy and Grosgrain Ribbon. See the Funky Brad in the middle?? That is from the New "ICE" brads collection. These babies come in circles or square and also in a alternate collection called "FIRE"
Want to have a look???? Follow the Blog Link to my Events Calendar and check out what I have on the go this weekend!!!!!! Yay!!!! I got to stamp today!!!!! Well, apart from a four hour marathon completing some swap cards that need to be in Arizona by mid week next week, I took a little time to complete the Limited Supply Challenge on SCS. Now, I was all excited about using some of my new stamps, but todays challenge was to use one of those neglected stamps that you have sitting around your cupboard......................well actually all my Rubbah has been quite neglected as of late!! This image is from the Greetings Galore set. It was a hostess set a few years ago and can you believe that I have never used this image?? Nope, not even once. The Pretty embossed Card is from DCWV and the Ribbon Charm is from Memory Makers (another something that has been sitting around for eons and eons!) Hope you enjoy this cheerful greeting. The flower was coloured with SU! 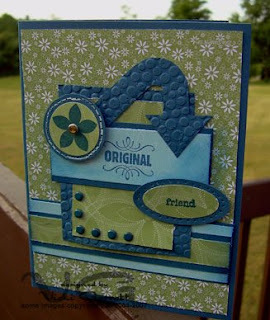 Stampin' write markers and the grass and sky were created by sponging on celery and caribbean ink. I used the white gel pen to make the scalloped border dotty!!!!! Did you see it? Now you don't! Oops!!! Big Faux pas on my blog. I did manage to put a post up a day or two ago. The card that I posted was one that I had submitted to Rubber Stamper Magazine quite some time ago. Anyway, I didn't hear anything about it, so I assumed it was okay to go ahead and post it. By coincidence, I went into one of my yahoo groups yesterday and saw a post congratulating me. Needless to say, that card has been published in their latest issue. I am not sure about the posting rules, but am thinking that it is supposed to be exclusive, so I pulled that post immediately upon getting the message. Anyway, I am hoping that they will send me a copy of the magazine, because I have yet to locate it here in town!!!! So, here is another card, that is definately safe to post. I am SO going through stamp withdrawl. I have been studying for an exam and still haven't had the opportunity to play with my New Catalogue preview sets, except for two designs, that I put together for my Stampin' Up! Team meeting, this being one. A Triangle Trifold card, the main image stamped with the Birds from the Zoofari set..............available in the New SU! Idea Book and Catalogue. The sentiment comes from "All in a Row". How do you like these delicious new colours??? These are three of the six New Colours for the 2007-2008 In Color collection (Blue Bayou, Purely Pomegranate (Yummy!) and Summer Sky DP!). Stay tuned for more samples in the next week or so!!!!!! 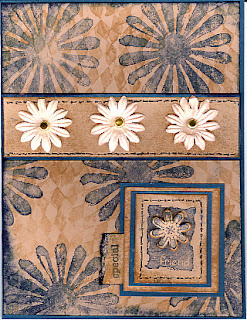 Directions to make this trifold card and other neat projects can be found on the Scor-Palwebsite. They have a great project gallery there featuring some of my favourite stampers. It's been a Long Time!!!!! Wondering where I've been??? Well actually it has been a very busy and hectic week. My Father took a bad fall last week (thank goodness he didn't break his neck) and severely damaged his shoulder. I had the role of chauffeuring him around for the weekend, since he was involved in the Rameses Shriners Ceremonial and had several duties to fulfill. That being said, stamping has been on the backburner for the last several days!!!! Yesterday I received my Preview sets for the new Stampin' Up! catalogue, which debuts on the first of July. I can't wait to share my new creations with you!!! 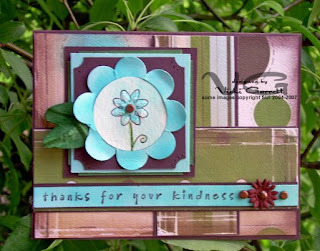 This card was created with Cruiseabella from Stamping Bella, Everyday Flexible Phrases from Stampin' Up!, Crate Paper and Prima Flowers. Brads, Cardstock, Aquapainters, glitter and brads are from SU! as well. Hope you all have a great day!!!! I'll try to be a little more diligent about posting this week! Quite often I am just totally stressed, but today I thought that I would touch on how to achieve a distressed feel to your cards. This happens to be a card that I created some time ago, but it is a fairly good example to illustrate my point!!! and I didn't have to stress myself out creating a new sample for this post! Creamy Caramel, Kraft and Earth tone papers are perfect for distressing (although you can get this look to a certain degree with pastels and jewel tones). The nice thing about the caramel paper is that it will almost take on a Leathery look as soon as you sponge over with ink. Taking a "cheap" Sponge, I rubbed over the card stock with a liberal amount of ink. Then going tone on tone (caramel ink to caramel paper) I stamped the harlequin background image from the Looks like Spring set. Rather than reinking with each tap, I continued to stamp off the in order to acheive varied tones and gradations. I continued to do the same with the flower image in Not Quite Navy Ink. Adding ink to a torn edge (see the "special" tab) will also give a rugged flavour to your project. The Faux stitching was done by piercing holes very close together and using a next to navy stamp n' write marker to create the illusion of thread. A few "flicks" of the Next to Navy Ink pad to the edges of the paper (direct to paper technique) adds to the Shabby Chic look. This look is particularly effective when you wish to use some of your more feminine or floral type stamp sets for a masculine look. Well, I keep repeating the same injury - I hold my paper in my left hand and cut with my right hand but I tend to cut into that little fleshy part between the thumb and forefinger! And I've done it more than once!! Now, how did I come about choosing a winner??? To make it totally random and unbiased, I had my DS Jonathon (10) choose a name off the list. I didn't tell him why he was choosing..........but I think he chose Susan because we have a family friend by the same name. Now for the MYSTERY Prize!!!! A HUGE box of Bandaids and some Polysporin come to mind after reading all about the variety and degree of blade and scissor cuts!!!! I could send ice to those with sprains, but I am not sure it would make it there in it's solid state!!!! Just kidding, I have some nice goodies coming your way Susan. Please email me at vickig@kos.net with your address and I will pop your prize into the mail this week!!!!! This card was made for the Saturday Inspiration Challenge on SCS. The Stamps are all from SU! Treat yourself and Blooming with Happiness, which are both retiring and Happy Everything. Colours used: YO YO Yellow, Tempting Turquoise and Dutch Girl DP from Daisy D's (?). Bobbin Ribbon and Cuttlebug Embossing templates were used to repeat colours and the circular theme. To Make the flame for the candle. I cut a dimensional into a tear drop shape, peeled the backing off and dipped in glitter!!! Apple Grosgrain and Silver Cording finish of the tag embellishment quite neatly, if I don't say so myself!!!!!!! Once again, Thanks so much for playing..........................I'm off to dream up my next contest!!!!! Betcha that title caught your attention!!! What is the threat, you may ask? Well stamping can actually be dangerous at times. There is always the risk of cuts; paper cuts, those nasty scrapes you can get when you put your finger underneath the Fiskars Slider Blades and ohhhhhhhhhhh I just shudder at the thought of what could happen with one of those guillotine type cutters!!! Now before I learned to place my paper ON TOP of the Background stamp, there was always a risk of spraining an ankle whilst stomping on top of the Stamp; as you placed it on top of the paper, on the floor to ensure you got the best impression................................Ever came close to taking out an eye with a flying eyelet? Or hammered your finger rather than that stupid eyelet setter. So, I would love to hear about your best stamping mishaps. Please submit a comment before this Sunday..................On Sunday I will do a random drawing for a Mystery Prize.................Believe me, it's not a mystery because it will be so enchanting. It's a mystery because I just thought this whole thing up and haven't had time to think about what I will give away. I know it won't be a Mercedes Convertible or anything, but I think I can come up with something decent!!!! Now back to what started this whole Triple Threat thing. I didn't have much time for stamping this week and I was getting behind in participating in my Splitcoast Challenges. So I combined three challenges into one card. The sketch and colour challenges were combined with the ways to use it challenge, which was actually to use retired Stamp sets. I used Nice and Narrow and Simple sayings 11. Nice and Narrow was a rather understated set, however I saw many beautiful cards designed. The patterned paper is from Crate Paper designs. It is wonderful paper with a rugged texture. 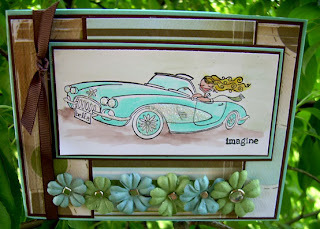 Stampin' Inspirations is a very nice blog. You may want to take some time to visit. Thanks Leigh for bringing this fun technique to my attention! The leaves for my flower are made by punching a small oval, inking the leaves quite heavily and scrunching and shaping them. So really, there was no threat of harm last night when I was making this card. I was thinking of calling this post a hat trick, but since I referred to that last week, I think that it is only fair to subject my readers to a one time application of a cheesy line!!!! Well, if I don't break away from this computer soon, I may have to forgo a shower in order to get to work on time. Hmmmmmmmmmm maybe that wouldn't be such a bad idea, I would get more done for the lack of visitors popping into my office to chat!!!! So, Have a Fantastic Day and PLEASE PLEASE post your stamping Mishaps!!!!!! I am stuck home tonight and could use the entertainment!!!!! !